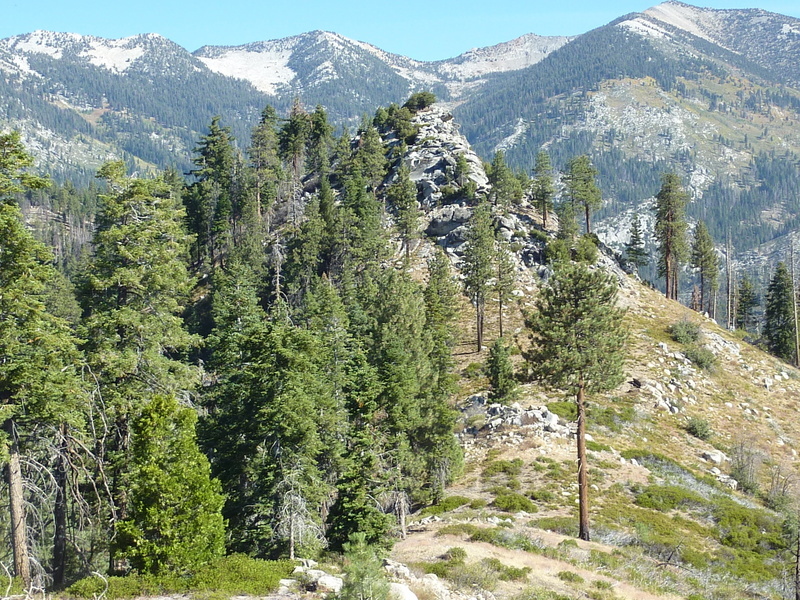 Stag Dome is a small rock outcrop rising 3,500ft above the South Fork of the Kings River. It is located on the boundary of Kings Canyon NP and Sequoia NF, separating the Deer Cove and Lewis Creek drainages north of the river. Though there is no trail reaching it, the cross-country is pretty easy, especially compared to the previous day's grueling effort. It turned out to be a delightful 4hr+ outing, covering about 10mi in a looping manner around the Deer Cove Creek drainage. Having camped at much a much higher elevation near Cherry Gap on SR180, I was up early for the nearly hour-long drive down to the Deer Cove TH just outside the national park boundary along the Kings River. It was 7a, just after sunrise, when I started up the trail. This decently maintained Forest Service trail starts climbing right from the start, first up the east side of the Deer Cove Creek drainage, then descending slightly to cross the creek and begin climbing up the west side of the drainage. At the 3.5mi mark, it reaches Deer Cove Saddle at the 6,500-foot level where a trail junction is found. One begins to get a view of the Grand Dike here, a collection of impressive pinnacles below Eagle Peaks and Happy Gap to the west. The left fork trail drops into the Grizzly Creek drainage towards these features which may make a fine, future outing. I continued up the right fork towards Wildman Meadow, the trail climbing the ridgeline forming the northern boundary of the drainage. The trail then goes over a higher saddle where it drops into the Grizzly Creek drainage, soon reaching Wildman Meadow. I left the trail at this upper saddle and continued cross-country to the east a short distance to Pt. 7,750ft at the park boundary. There is an imposing summit block here with a class 5 chimney that I didn't attempt - of course I would have if it had been an approved bonus peak, but there seemed a non-zero risk of injury, so I let it be. I turned south and began following the ridgeline in that direction, about a mile to Stag Dome remaining. There are fine views of the immense Lewis Creek drainage to the northeast and east, Kennedy Peak forming the highest point along its northern boundary. There are vestiges of an old trail along the ridge, perhaps just a use trail formed from occasional use over the years, but in any case, the travel along this partially forested ridge is quite nice. The ridge grows rocky just before reaching Stag Dome, class 2 if one looks for the easiest way. I reached the open highpoint soon after 9:30a, after a little more than 2.5hrs. The Monarch Divide rises high above the Lewis Creek drainage to the north, Comb Spur to the northeast, the higher peaks of the park to the east and southeast. There are several lower rock outcrops to the south that offer slightly better views of the Kings River far below. I left a register at the summit before continuing south to visit the other rock outcrops. At the first one below Stag Dome, I found the remains of a cast iron stove that was lugged up here many decades ago. There are hundreds of rusting food and fuel tins, evidently this was once quite the party place. I suspect it was a refuge for deer hunters looking for game wandering cluelessly out of their safe haven within the national park. Below the lowest rock outcrop, I dropped down onto the SW Ridge which descends in a very fine fashion back to the Deer Cove Trail. There is even more evidence of a use trail along this ridge, and a number of rusting tins strewn here and there to suggest it once saw more usage. There was no real brush to contend with despite fire in the past few years, and by 10:40a I was already back on the Deer Cove Trail. I finished up just after 11a, the Jeep still the only vehicle in the little-used parking lot. It had warmed considerably since the 47F temp I started with, the outside temperature now registering 84F. It would be another warm one today, so I drove back up to Grant Grove to spend the rest of the day in more comfortable temps.